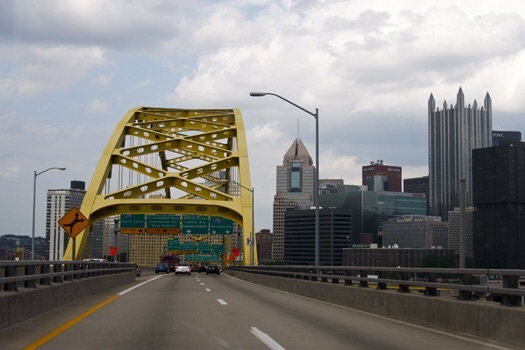 Pittsburgh and Cincinnati have rival sport teams and rival yellow bridges. A longstanding rivalry exists between the cities of Pittsburgh and Cincinnati. If you’ve ever visited our neighbor in western Pennsylvania, you’ll notice several similarities such as vibrant downtown cores along the river with stadiums and hillsides that lead to sweeping views of the city. The Bengals/Steelers rivalry is well known as well as the one between the divisional rivals of the Reds/Pirates. Both our cities lack NBA teams, but when it comes to professional hockey, the Cincinnati Stingers boast a winning record over the Pittsburgh Penguins (unfortunately the Stingers and the WHA folded and the Penguins still remain). Now we have another sport to clash over and FCC is hoping that brings out the fans for another record setting attendance. If you caught owner Carl Lindner’s letter last week, they're hoping to draw 25,000. They're also requesting that everyone wear orange. There’s no specific rivalry between FC Cincinnati and the Pittsburgh Riverhounds themselves, but the history between our cities’s various athletic clubs would seem to dictate that they'd inevitably become rivals. Personally, I hope it's not a potential rivalry that brings people out, but simply an FC Cincinnati match itself. Cincinnati, come see for yourself what makes soccer at Nippert and this team so special. In the process you might even get to see one of our pro teams beat a Pittsburgh team for the first time in a long time. This Saturday is the first home afternoon match (it starts at 4 PM) and the first of three times we’ll play “the hounds.” The team was formed in 1999 with the Riverhounds unique name and logo. Look, you can say what you want about the way soccer teams are named in this country. When Major League Soccer debuted, teams took on names in similar form to how the other major leagues were doing it: City Name, Team Name. You had teams like the “Kansas City Wiz,” the “Dallas Burn,” and the “New York/New Jersey Metrostars.” Over time, new marketing and branding strategies took hold. Some of MLS’ founding teams stuck with their original names, but others took inspiration from European clubs. The Wiz became Sporting Kansas City, the Burn became FC Dallas and the New York/New Jersey mouthful enlisted a sponsor and became the New York Red Bulls (despite still playing in New Jersey). As more teams joined, several kept the European inspired names coming. Opinions go back and forth both ways, but I don’t have a problem with the international influence. Soccer is much different than this nation’s established sports and leagues. The American soccer landscape has changed dramatically the past 20 years and as MLS has rejected its mid 90s quest for acceptance among the more established sports culture, even the minor league clubs have gone for more traditional naming. Hate on it all you want, but I have no problem with a team being named Futbol Club Cincinnati or Louisville City Football Club. I also don’t have a distaste for the “city name sports team” mantra. The San Jose Earthquakes, the Portland Timbers, the Seattle Sounders - yeah that’s the typical way to name an American sports team, but I understand the tradition behind those particular names. Indy Eleven is the more traditional American route, but at least that's unique and creative. Was that the best logo and name you could come up with? Yeah, it's been a "Ruff" Day. What’s a Riverhound you ask? Hell, I wish I knew. Apparently the name was derived from a “name the team” contest in which “Pittsburgh Riverdogs” was the winner (I don't think very many people wrote in). At some point someone made a typo on some official paperwork or a conscious decision to rename the team “Riverhounds” happened. Judging by the logo though, I’m pretty sure someone bought a minor league hockey team and just decided to play soccer when they couldn’t find ice. I’m no fan of Pittsburgh’s sports teams, but you have to have some respect for the following they have. They all (the Pirates to a much lesser extent) have this reputation, this identity. They represent the steel city, the city of six super bowl trophies. They’re all clad in black and gold. Steelers. Pirates. Penguins. It just doesn’t fit. I’m not saying become FC Real Pittsburgh United 1999 or anything, but the logo could use some updating and the name could be, well, somewhat relevant I guess? To be fair, the creek dogs have a black and gold home jersey. However, the blue away kits, overly minor league logo of the late 90's, and random name don't seem to jive with traditional Pittsburgh athletics. Nevertheless, the organization has stuck with the East Coast Hockey League logo, even substituting a soccer ball in place of the “O” in "Riverhounds." They have a decent following, a group of supporters known as the Steel Army. They averaged about 2,630 fans at home last season and like their MLB brethren, their stadium has an incredible view of the city skyline. But this weekend, they come to Nippert. Where 10,000 tickets are already sold and The Bailey is sure to be packed with supporters. Pittsburgh comes in with a record slightly better than last place Montreal: 0 wins, 3 losses, 3 draws, 3 points. Their lead scorer and main threat was a guy named Romeo Parkes. I say “was” because, as of Monday, Parkes was fired. While playing New York Red Bulls II over the weekend, things got quite chippy between Parkes and New York's Karl Ouimette. After the two received red cards and Ouimette began walking away, Romeo trotted after him and kicked him square in the spine with his cleats. As Ouimette fell to the ground, surrounding players of both teams started to intervene while Parkes still ran his mouth. Ouimette was hauled off on a stretcher, but was able to travel home with the team. By all reports, he seems to be ok. Two days later, Pittsburgh’s front office delivered a kick of their own: sending Romeo straight to the curb. While Parkes would probably be a favorite if Joey Porter was the Riverhounds coach instead of working for the Steelers, the Pittsburgh front office made a good decision. I could make a joke about Parkes' actions as being those of a "typical Pittsburgh pro athelete," but thinking of the Bengals' Vontaze Burfict prevents me. On paper, even before Juliet's boyfriend got himself fired, Pittsburgh looked like a team to beat. Then again, so did Harrisburg. FC Cincinnati needs to continue tightening up the defense and smoothing out the attack. With a hopefully strong crowd behind them, they might be the first Cincy sports team to defeat a Pittsburgh athletic franchise in quite a long time. It also helps that of the 7 goals the Riverhounds have scored so far this season, 5 of them came from Romeo Parkes. One of their top offensive threats is not only neutralized, but unemployed. 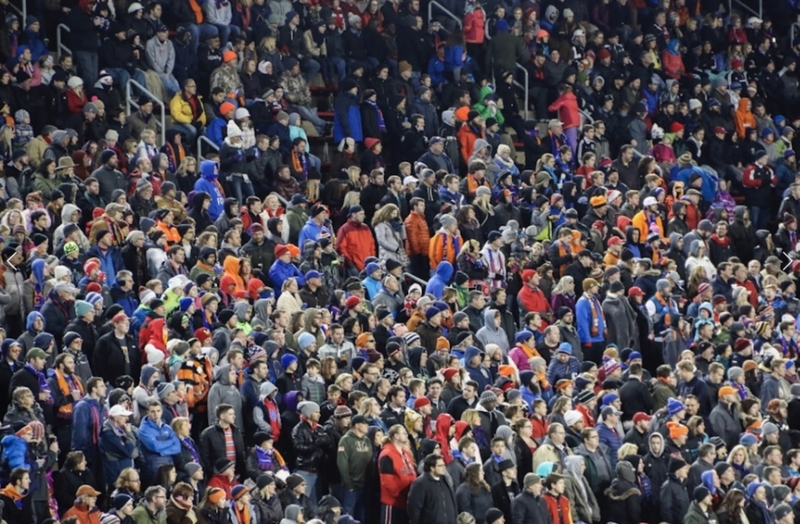 Either way, I hope pro soccer and what FC Cincinnati has become is what draws newcomers out to Nippert, on top of prospective victory over a regional rival. See you (and hopefully 25,000 others) at Nippert on Saturday afternoon! Wear ORANGE! We'll be at the traditional meeting spot of Mecklenburg Gardens starting at noon. All are welcome, especially any Steel Army folks who might be making the drive down to see their Riverhounds play. Stand with Die Innenstadt. Stand with Cincinnati. Ronny Salerno is a founding member of Die Innenstadt as well as an author and photographer who appreciates history and Waffle House coffee. Tom Niehaus is an awesome guy who edits these posts for him and offers creative contributions.